Have you even spent years pondering a visit to some place only to find that once you finally make the trip, it’s even more spectacular than you expected? Well, that was what my recent outing to the Jet Propulsion Laboratory in Pasadena was like. 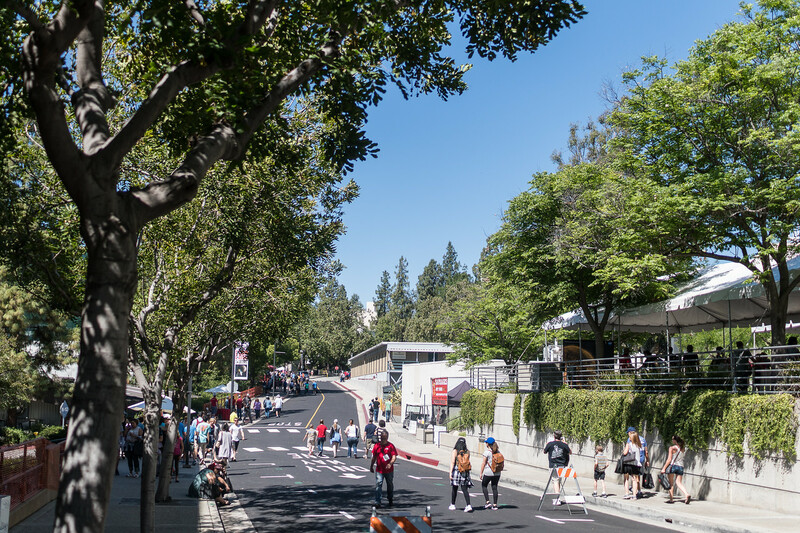 Having finally secured tickets to the annual JPL Open House event which was held the weekend of May 20-21st, I had no idea what it would be like. I was expecting a couple buildings and a parking lot. Where did I get that Idea? I couldn’t have been more wrong. Sitting on the slope of an arroyo, the complex is much more like a college campus. At least that’s my impression. There were lots of trees, pines that dropped the occasional cone! I’m sure these were not there originally. The weekend of May 20th was a very hot, but that didn’t stop people from turning out for this event. The streets weren’t crowded when I first arrived, but that didn’t last long. 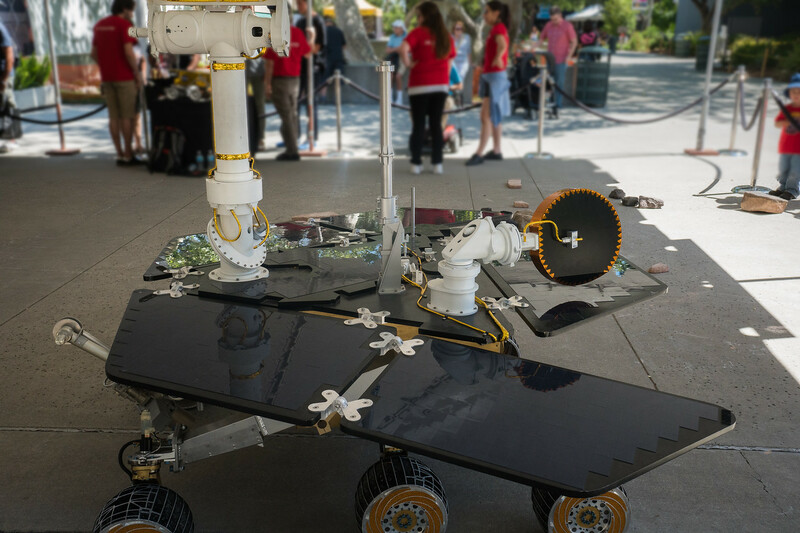 There was so much to see, I could have spent both days at JPL and still not have seen it all. One of my first stops was the building featuring the solar system exploration missions. Before entering we were told about how the Cassini spacecraft discovered that Enceladus is an ocean world. This building itself wasn’t large, just one floor, but I managed to spend an hour there. What can I say? It was so exciting! I learned about the ion engine that powers Dawn. How much time did I spend talking at that stop? 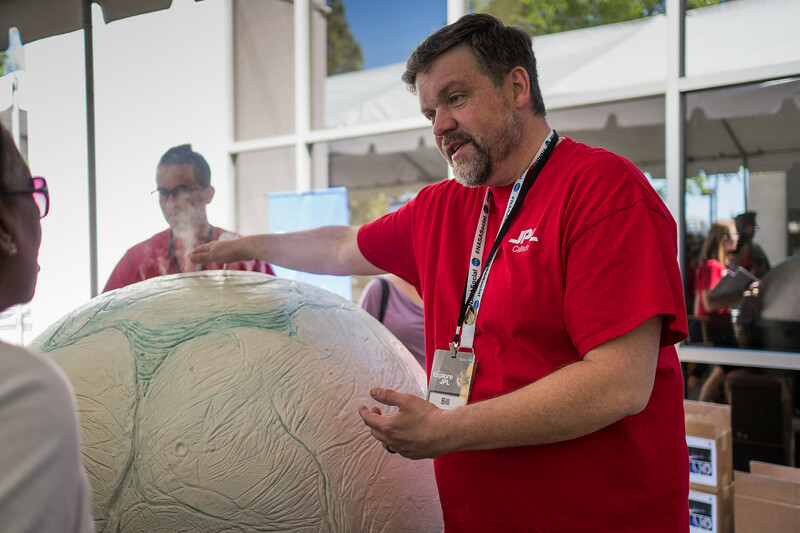 As seen in the photo above, JPL personnel were dressed in red shirts and there were a lot of these people present, each eager to tell us all about his or her particular project. 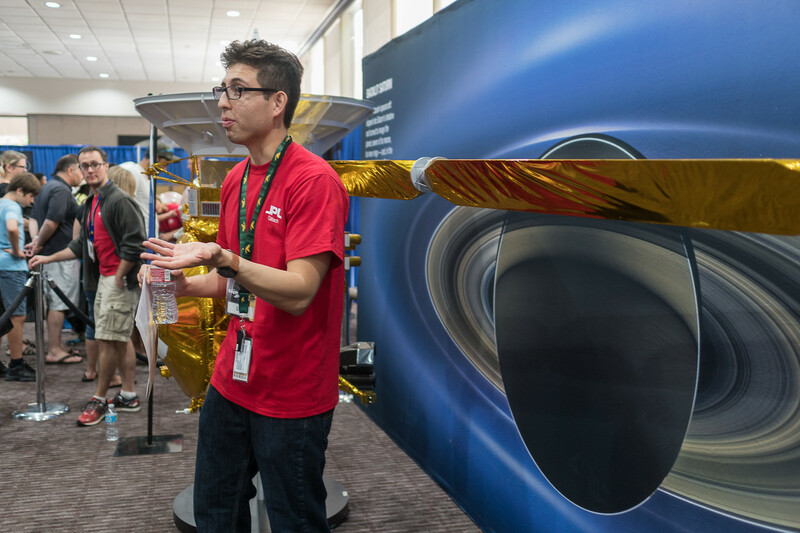 I spent a long time with the Cassini-Huygens people, admiring their model spacecraft and listening to their stories about how they started on this mission twenty years ago. 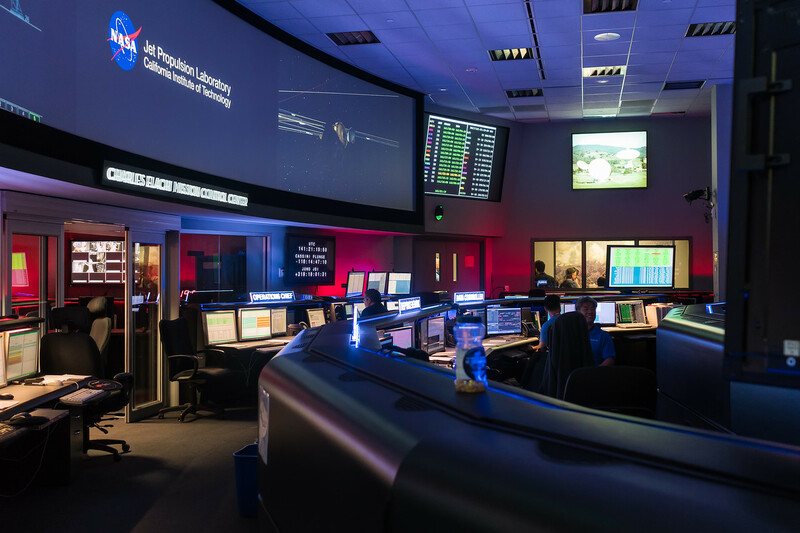 As some of you know JPL operates NASA’s Deep Space Network, the communications systems (located in California, Spain, and Australia) that keep track of the interplanetary spacecraft missions. This is a personal favorite subject for me, and of course I was eager to get some information about it as well as see Mission Control. There was a line for this building but it moved quickly. Mission Control was worth the wait! The day went by much too quickly and soon it was time to leave. I did stroll past the Mars Exploration tent on my way back down from Mission Control. This was a popular spot. Who can resist these cute little rovers? I think the above rover is similar to Opportunity, which landed on Mars in 2004 with a life expectancy of about 90 days. Thirteen years later, that little explorer is still going strong! The Open House is over for 2017. It’s back to work as usual for all those folks in the red shirts. As for the rest of us, we’re waiting for next year. I can’t say enough good things about this event. It was very well organized. As the day of the event drew near, I received information about parking, ticket admission requirements, and even the traffic in Pasadena! Signage was terrific, on the freeway and on the roads leading into JPL. There was no chance I could have lost my way. In addition, they must have had every employee on the payroll working this event! Red shirts were everywhere and willing to help. How could anyone not have a good time? Did I enjoy it? Yes, indeed. And so, if you have any interest or curiosity about JPL, look for this event next spring. Be persistent, and get your ticket! Guess what? It’s free! To see more images from my visit to JPL, please click here.